Q&A and Giveaway with authors, Magnus Flyte! I was a bit overwhelmed by the new Stephen King to take on his son's novel, NOS4A2, so I enlisted my husband, the reader who can chomp through a thick book like this in two days, to do the honor. I started listening to Heart-Shaped Box a few months back and it was pretty eerie. I know I will definitely embrace Joe Hill's work more at some point. The author of the critically acclaimed Heart-Shaped Box, Joe Hill is a two-time winner of the Bram Stoker Award and a past recipient of the Ray Bradbury Fellowship. His stories have appeared in a variety of journals and Year’s Best collections. He calls New England home. 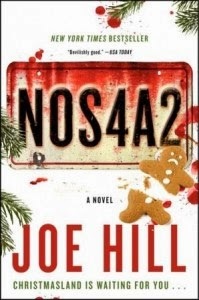 Find out more about Joe at his website and follow him on Twitter: @joe_hill. I'm thinking my husband would enjoy this one, too. I'm so glad you liked it! Thanks for being on the tour!